The floors are done! Downstairs. Upstairs? That is a future project. The carpet is new and neutral enough to serve until we finalize our plans for the second level. Now we are moving on to the entryway. The first impression of our house is anything but appealing, inside or out. 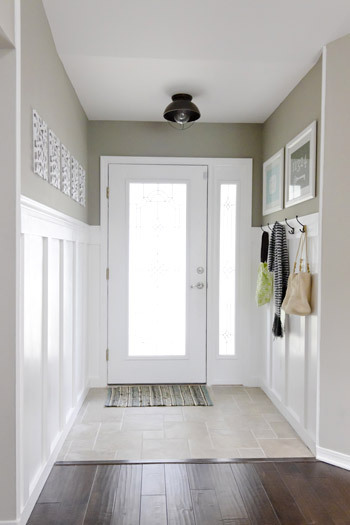 The entry way may be the only impression someone gets of the inside of your home. And its certainly first for everybody you allow past the front door :P I want our entry to give a sneak peak of the rest of the house, yet stand alone as a slightly more formal space. Time to seek some inspiration. 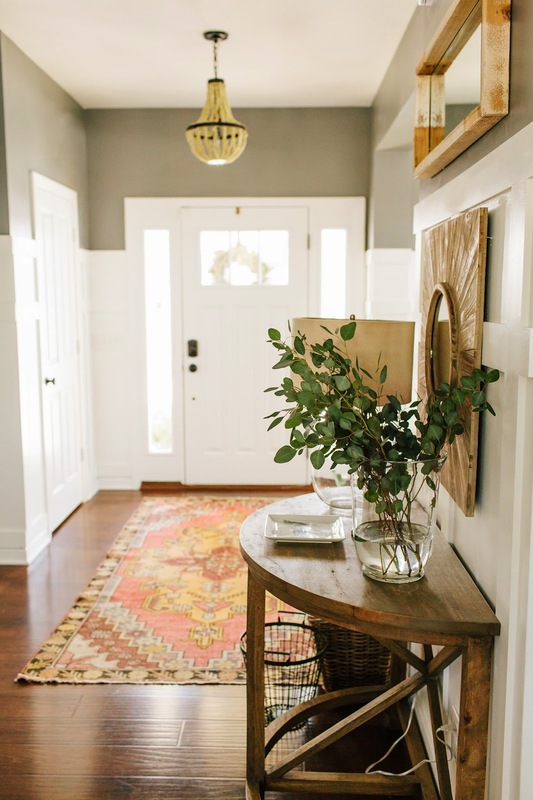 I love just about everything in this entryway. 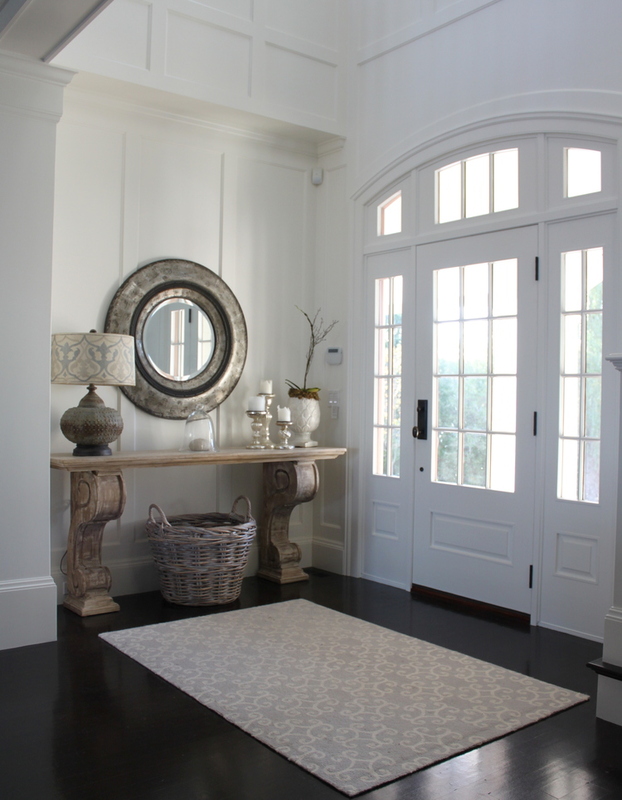 The door allows so much light into the space, the crisp white woodwork keeps it fresh with just a touch of formality, and the light wood console table brings in some warmth. Realistic for our space? No we are talking :) Again, the windowed door allows for natural light, that we are clearly in desperate need of. The white board and batten lends just a touch of modern farmhouse to the mix. The grey walls add some contrast. A few hooks for storage... we might be in business. Now that the old coat closet is gone, we have room for a console table too. More like this. I also like the additional horizontal board and no top ledge to interfere with art. I have a large piece my grandmother painted before I was born that is destined for the wall above the console table. That painting is so very much a part of who I am and my story. I can't wait to give it a stage to show it to the world. My little slice of the world anyway. That addresses the wall on the right, but we also have the widened entry into the family room that we need to liven up. The new floor covered the evidence at ground level, but the wall and ceiling aren't looking so great, even with the drywall patch job. I have plans to add sliding barn doors on the family room side of this opening. I have wanted to add them to our home long before they were popular...2005? And this house with its modern farmhouse meets industrial feel lends itself to it perfectly. Problem. No where to actually attach the hardware. Ah, a solution to our problem. Nothing like rustic wood yumminess to start adding some charm. 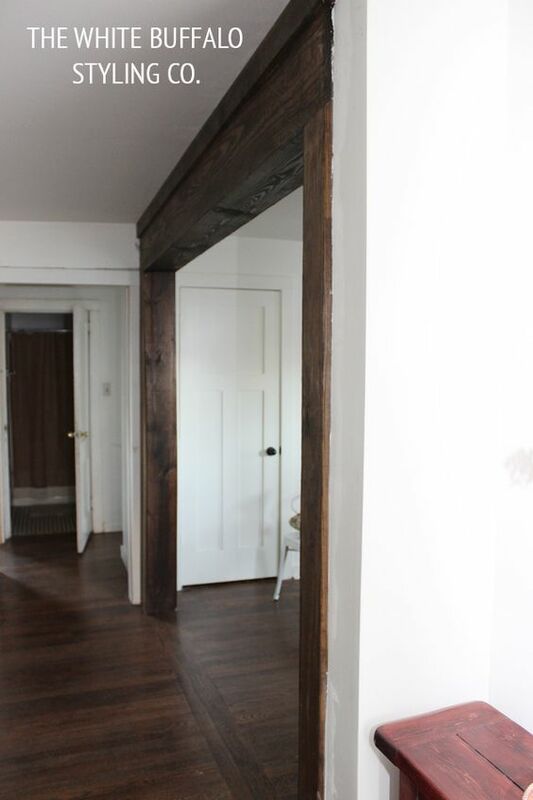 So, french entry doors, white board and batten, rustic wood beams, and grey upper walls. A little rustic, a little refined. And lots of opportunity to introduce the overall feel that we want in this house, a place to begin telling our story.